1) Molly Wright Steenson's new site, Active Social Plastic has a very interesting post on the bluff as a type of architectural gesture. The only thing missing is a Toblerone Bar. 2) Websites can be the site of recovery for architectural esoterica -- of the written variety of course. Check out The Honeywood File, a website dedicated to republishing a long-forgotten architecture text from pre-World War II England. 3) Although this event has long passed, the website for the SVA's Where The Truth Lies conference deserves some careful attention. 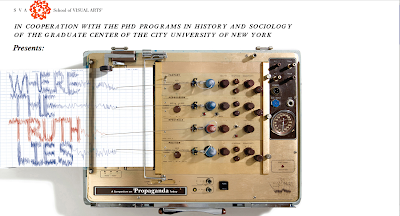 Although the conference was ostensibly about propaganda, the use of a polygraph machine here is fascinating, to say the least. 4) The website for the current MoMA exhibit, Design and the Elastic Mind, is sure to draw ire from webgeeks out there. Although it is as cluttered and messy as the "real" show, this site is quite fun, in my own opinion. 5) a456 was reviewed in The Architect's Journal. Apparently the author of the review, Sutherland Lyall, thinks that my name is a pseudonym.